Published on Saturday, March 16, 2013. 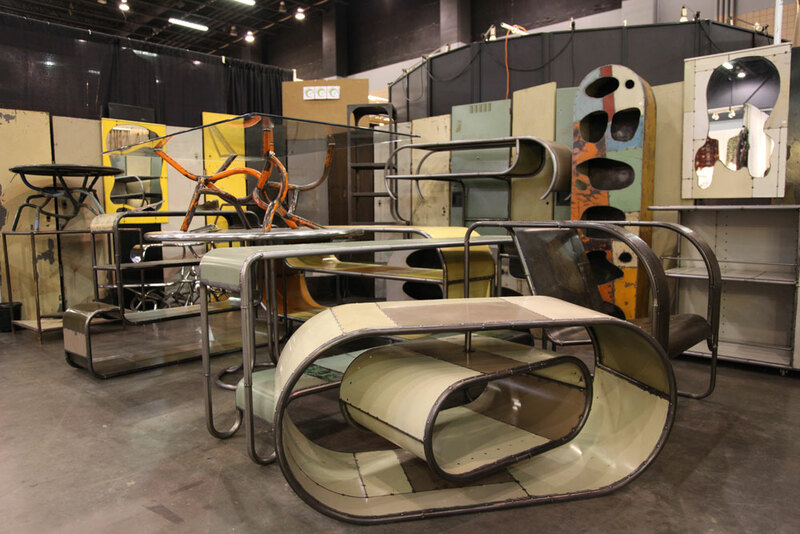 Traditional techniques meet contemporary style, industrial manufacturing stands next to nature, and extraordinary design is on display at the ACC Show in Atlanta. On Friday afternoon, Awards of Excellence (AOE) were presented to four outstanding artists who exemplified the best in contemporary craft and presentation of their work, and another artist was awarded a residency at the Hambidge Center in Georgia. This year’s AOE juror was Sarah Schleuning, curator of decorative arts and design at the High Museum of Art in Atlanta. Jamie Badoud, executive director of the Hambidge Center, was on hand to present the Hambidge Residency Award. 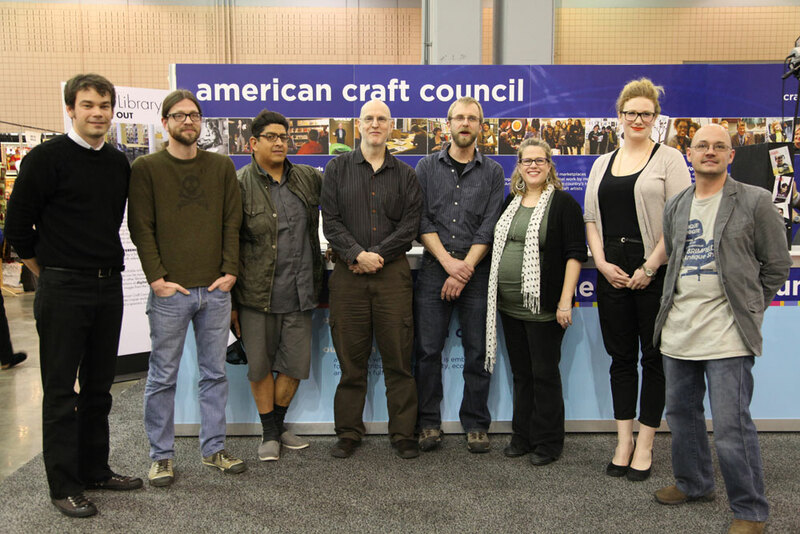 Doug Meyer (booth 1016) is no stranger to accolades; his amazing furniture that reuses found objects and industrial materials also earned him an Award of Excellence at the 2013 ACC Show in Baltimore. Taking inspiration from his surroundings in northeast Ohio, Meyer creates furnishings that stay true to the original industrial materials, while also emphasizing quality design and a keen aesthetic sense. Meyer sells his work through his company, Rustbelt Rebirth. Old meets new in the ceramics of Barry Rhodes (booth 302), who mixes traditional transferware technique with a contemporary, patchwork style, somewhat reminiscent of old sample plates. Rhodes draws his inspiration from a variety of sources – figurative and abstract sculpture, modern architecture, and course pottery – and his fascination with the patchwork style is due to its recurrence throughout nature, from physics wave diagrams to wooden hulled boats. Playful, pure, and vibrant are just some of the colorful words used to describe the dynamic surfaces and classic forms of Justin Teilhet’s (booth 802) work. Teilhet thinks about surface tension in composing his ceramics, which combine a variety of glazes with porcelain. Above all, however, he emphasizes visual simplicity to create a stunning purity of form. 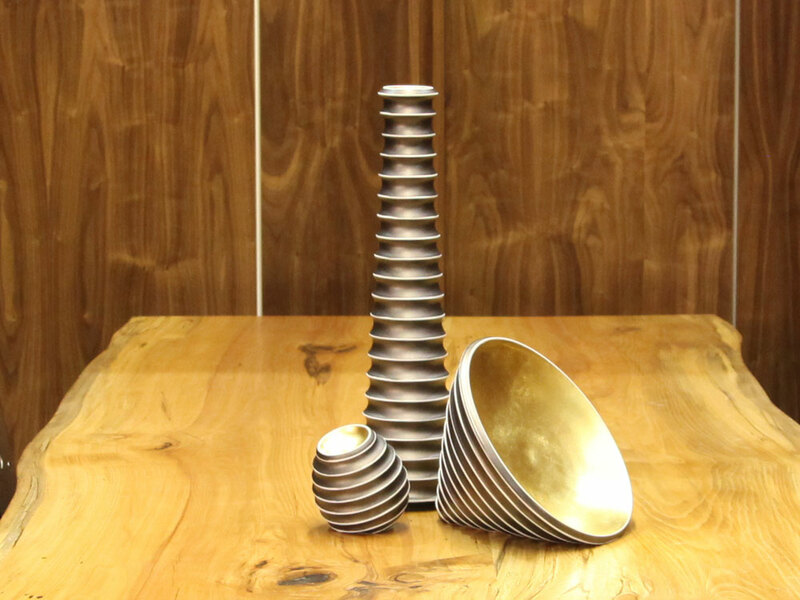 The booth design award is meant to highlight an exhibitor who goes the extra step to display wonderful objects in a setting that highlights and complements his or her work, which is certainly the case for jewelry artist Eric Silva (booth 1404). 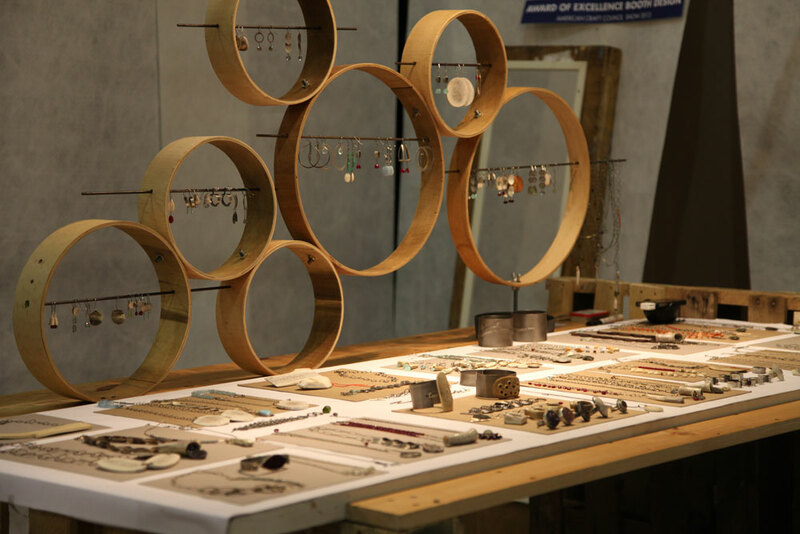 Silva’s booth, which made use of wooden planks, crates, and barrel rings, highlights the simplicity of design and honest interpretation of materials that the artist emphasizes in his jewelry. The Hambidge Residency Award was created for an artist whose work connects to the natural environment promoted at the Hambidge Center. 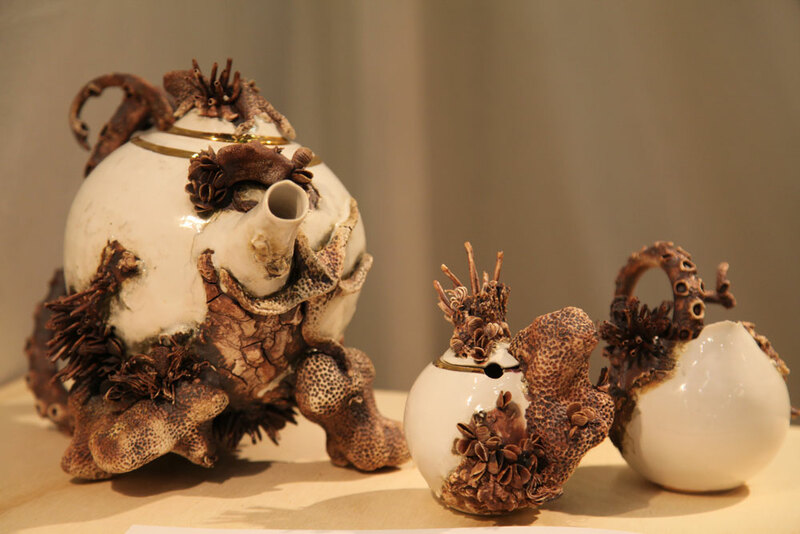 Ceramic artist Mary O’Malley’s (booth 1014) recent Bottom Feeders series, in which she creates porcelain teapots and cups that include organic forms inspired by ocean life, embraces the focus on nature that is promoted by Hambidge’s mission. Mary O’Malley’s award will allow her to spend a two-week residency at the Hambidge Center to further develop her work. 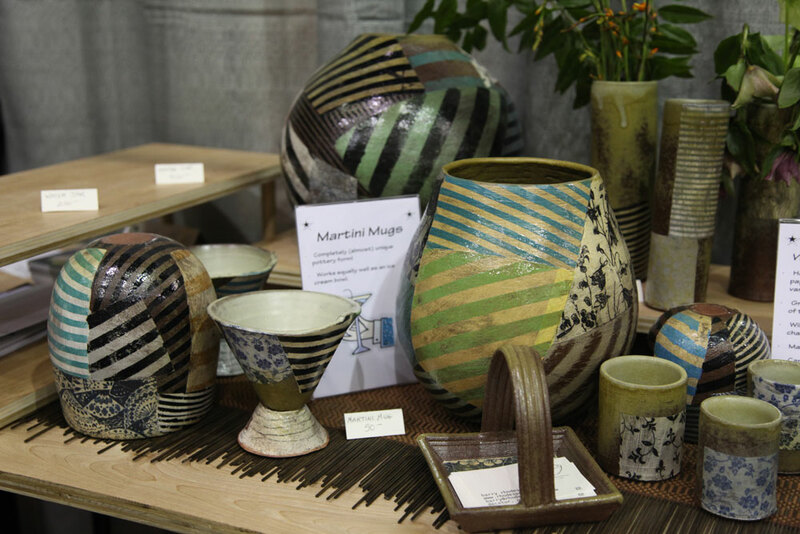 Mary O'Malley's collection "Bottom Feeders" at the 2013 ACC Atlanta show.